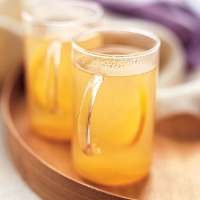 This warming, sweet and spicy lemony drink contains vitamin C, which helps ward off colds, while ginger is ideal for soothing upset stomachs. Pour the lemon juice into a measuring jug and add the sliced ginger and honey. Add enough boiling water to the jug to measure 300ml and stir. Pour into 2 heatproof glasses, add the whisky if desired and serve immediately, garnished with a thin slice of lemon.